With the right lifestyle, experts say, chances are that you may live up to a decade longer. What&#x2019;s the prescription for success? National Geographic Explorer Dan Buettner has traveled the globe to uncover the best strategies for longevity found in the Blue Zones: places in the world where higher percentages of people enjoy remarkably long, full lives. And in this dynamic book he discloses the recipe, blending this unique lifestyle formula with the latest scientific findings to inspire easy, lasting change that may add years to your life. You&#x2019;ll meet a 94-year-old farmer and self-confessed "ladies man" in Costa Rica, a 102-year-old grandmother in Okinawa a 102-year-old Sardinian who hikes at least six miles a day, and others. By observing their lifestyles, Buettner's team has identified critical everyday choices. Question: In your book, you identify the "Power 9": nine habits or behaviors all Blue Zone populations have in common. Could you talk about one or two that the average American takes most for granted? Dan Buettner: Many Americans exercise too hard. The life expectancy of our species, for 99.9% of human history, was about 30 years. The fact that medicine has pushed life expectancy to age 78 doesn't mean our bodies were designed for three-quarters of a century of pounding. Muscles tear, joints wear out, backs go out. The world's longest-lived people tend to do regular, low intensity physical activity, like walking with friends, gardening and playing with their children. The key is to do something light every day. I also think the trend toward isolation is a mistake. Drive down any American street at 9:00 pm and you can see the greenish glow of the television or the computer in people's window. We've become an increasingly isolated society. Fifteen years ago, the average American had three good friends. Now it's down to two. We know that isolation shaves good years off of your life. In The Blue Zones, I advocate reconnecting with your religious community and proactively building friendships with the right people. Question: Is there something about the physical landscape that contributes to an area being a Blue Zone, or can people make their own personal Blue Zones, regardless of where they live? Dan Buettner: Staying young and living long is mostly a function of your environment... and the good news is that to a great extent, we each have control over that environment. In the Blue Zones around the world, people live in places where walking is the main means of transportation, where the sun shines strong all year long so they get enough vitamin D; where they have established social norms that bring people together in supportive groups or clubs. The Blue Zones book shows you how to take about two hours and set up your home, your social life and your work place to help you get up to 10 more good years out of life (and look younger along the way!). Question: Are Blue Zones about living longer, or living better? Dan Buettner: Both. The same things that get you to a healthy 100 get you there better. The Blue Zones offers a completely different way to think about longevity and youth maintenance. If you look at the Power9a? ?the common denominators of the longest-lived peoplea? ?you see that they tend to put their families first, they belong to a faith-based community and they know their sense of purpose. All of these behaviors are associated with 3-6 years of life (which is better than any diet can promise) and they're good years. In other words, the same Blue Zone tenets that will help you get to a healthy age 90 will help ensure those years are vital and enriching. Question: If considering all nine habits at once seems overwhelming, what's the first step someone could take toward living a more enriching, longer life? Dan Buettner: The good news is that the Power9 is an a la carte menu: by no means do you have to do all nine to gain more good years out of life. In fact, do six of them and get about 90% of the benefit. The most important thing you can do is building your own Right Tribe. Which is to say, all of the world's longest-lived people were born into, or consciously chose to associate with, the right people. The Framingham Studies show us that if your three best friends are obese, there's a 50% better chance that you'll be obese. The reverse is true too. If you dine with people who eat healthy food, you're more likely to eat healthy food; if the friends you spend the most time with play a sport, you're more likely to join them. As your mother said, "You're known by the company you keep." You're also likely to resemble them. With the right lifestyle, experts say, chances are that you may live up to a decade longer. What&#8217;s the prescription for success? National Geographic Explorer Dan Buettner has traveled the globe to uncover the best strategies for longevity found in the Blue Zones: places in the world where higher percentages of people enjoy remarkably long, full lives. And in this dynamic book he discloses the recipe, blending this unique lifestyle formula with the latest scientific findings to inspire easy, lasting change that may add years to your life. Buettner&#8217;s colossal research effort, funded in part by the National Institute on Aging, has taken him from Costa Rica to Italy to Japan and beyond. In the societies he visits, it&#8217;s no coincidence that the way people interact with each other, shed stress, nourish their bodies, and view their world yields more good years of life. You&#8217;ll meet a 94-year-old farmer and self-confessed "ladies man" in Costa Rica, an 102-year-old grandmother in Okinawa, a 102-year-old Sardinian who hikes at least six miles a day, and others. By observing their lifestyles, Buettner&#8217;s teams have identified critical everyday choices that correspond with the cutting edge of longevity research&#8212;and distilled them into a few simple but powerful habits that anyone can embrace. Here in the U.S. centenarians are the fastest growing age group. At the Dept of Aging UNC Chapel Hill the physicians address all the hazards people need to avoid to keep healthy and active in their age group, many mentioned in the book such as community, having fun, attitude and also diet and wellness. Health is wealth. The natural life span is stated in the Vedas of India to be about 125 years per individual. A man close to Queen Victoria, her yogist, lived to be 145 years of age it is reported. As someone here mentioned of course, dating of birth years is now more precise and documented. However I think 145 years would be a possibility for a well lived lifetime. It's necessary to bring all the ideas home (even from the internet) and make them work in one's kitchen and lifestyle. I start every season with a renewal of my "vows" for a more natural home and life, especially in the kitchen. Just looking at one's trash and one's refrigerator and food stores says a lot about us!!! If your trash bag is full of packaged food boxes, cans and containers for "fast" food meals, you might not be on track!!! Every season is a great time to renew one's physiology and unwind the DNA we were given (blessed with) at birth. To keep the DNA young, some light diet days 3 or 4 times a year might be good. That would be eliminating heavy toxic foods and eating more light foods like veggies and fruit and some well cooked rice along with fresh juices. The book gets us back to basics like diet, rather than a lot of supplementation, although most of us have our favorite herbs, pills, prescriptions that we enjoy and feel they assist us in our journey in life. I certainly don't go against my doctor's recommendations, but I always like to have my anchor in life be the tried and true ways of living and eating that engender longevity. Now that we have the internet its easy to get herbs and all kinds of products from all over the world. I just got a delivery of some of India's best herbal products from the Mohan estate outside Dehli. All processed and grown organically. And for the world health at large, it seems getting back to basics will aide the environment too. The Blue Zone, Dan Buettner's study of four healthy communities around the world, could be the most important book you will ever read--if you apply it to your life. As one of Buettner's interviewees, Dr. Ellsworth Wareham, states on page 157, "You can tell somebody what to do, but it's up to them whether they do it" Dr. Wareham, by the way, was at the time of the writing of the book, 91 years old and still actively performing open heart surgery. The Blue Zones are four regions of the world where large numbers of people live long and healthy lives, often past 100 years of age. Buettner, who is an explorer and writer, not a medical or health professional, is noted for his work on longevity that appeared in National Geographic magazine. The zones include the Barbagia region of the island of Sardinia off the coast of Italy, the Motobu Peninsula of the Japanese island of Okinawa, the Seventh Day Adventist community in Loma Linda, California and the Nicoya Peninsula in Costa Rica. Each of these areas has a number of centenarians that is substantially greater than normal. It should be noted that each of these communities is relatively isolated--and as modernization encroaches on them the younger generation is losing this healthy condition. Buettner devotes one chapter of the book to his visit to each place where he and his colleagues interview these people and try to determine the reasons for their longevity. For each zone Buettner lists a variety of factors. The last chapter of the book provides a summary of nine factors that readers can apply to their own lives to live healthier and longer as well as a website to set up their own plan. I am not going to provide any further information because I really want you to buy the book and apply it to your life. Needless to say some of Buettner's findings are obvious--exercise is good for you, junk food is not. The one negative (one star) review alludes to this idea. But a number of findings may not be so apparent to you without reading the book, and besides, it is fun to read about Buettner's experiences with these old folks! Beam me to the Blue Zones! Blue . . . the color of peace, tranquility, and everlasting life. Standing at the edge of the ocean, big waves splashing cool, salty water over my toes, I look out over the ocean and up at the turquoise sky, feeling as one with the earth. The ocean, where life began, and the sky, where my soul will later disappear, show the color blue as far as I can see. Somewhere in between the beginning of life and eternity lies the Blue Zone, a place offering longevity, good health, and contentment. While the Blue Zones described in Dan Buettner's chronicle are found in four specific locations broadly spread across the earth, he tells us in detail how we can create our own "Blue Zone." These four places, populated with many centenarians, share their secrets with us through the magnificent stories told to us by Dan Buettner. I ran across a newspaper article about The Blue Zones when I was researching why obesity seemed prevalent in certain departments of my company. It seemed to me there must have been a great deal of negative influence on each other, perhaps a contagious attitude of not caring what they eat. Dan confirmed what I suspected, stating that studies have shown that if your three best friends are obese, you have a 50 percent greater chance of also being obese. The Blue Zones have taught us that in order to live longer, healthier lives we need to surround ourselves with the right people, people who reinforce the right habits. We can learn so much from the inspiring stories of the people in this book. Marge Jetton, 100 at the time the book was written, is shown in a photograph lifting weights. She begins each day with a mile walk, a stationary bike ride, and (of course) lifting weights. In our literary visit to Costa Rica, we meet Juvenil Munoz, a 90 year old man who eats mostly beans, tortillas, fruit, and once a year, beef when he butchers a cow. Yes, you read that right, just once a year he eats beef. These are just two of the amazing people you will meet in this book. Why don't you order it so you can meet the others? You'll learn something special about life from each and every one. Some books are for dieters, some are for athletes, and some are for cooks. The Blue Zones is for everyone. Even if you're one of the few people who don't care about living a long life, you'll love the journey through this book. It is like no other you've ever taken. Beam me to the Blue Zones! Although this sounds like some kind of "amazing find" in the health world, Buettner's information has been well known in the nutritional literature for decades. I have over 30 years experience in the medical field and specialize in weight management, as it applies to treating and preventing chronic diseases. Numerous other authors have documented this type of information--that eating a diet high in "whole, real foods" is HEALTHY, and eating the opposite--the typical highly processed, high-calorie diet most Americans eat is NOT HEALTHY. This book was really an eye-opener! It has inspired me to change some of my not-so-healthy habits. This is the only body I've got, and now that I've reached middle age, I realize I need to work some more on the upkeep! I read this book and it gave ways various cultures with long lived populations lived. I got good ideas from the reviews of the cultures which will help me help others as a professor and help myself! I thoroughly enjoyed this book. There are a handful of books I have read that have immediately affected my life, caused a change in behavior, or redirected me down a new path. This is one such book. Blue zones are those areas across the globe where pockets of longevity can be found. In blue zones, there are an unusually high number of centenarians living compared to other populations. In The Blue Zones, the author, Dan Buettner, explores four blue zones: Sardinia, Italy; Okinawa, Japan; Loma Linda, California; and the Nicoya Peninsula, Costa Rica. After reading about the lifestyles, eating habits, cultural customs, and social behaviors of the centenarians living in the blue zones as introduced in this book, it has made me realize how out of synch I am with the natural and spiritual rhythms of life. And I don't mean this in an "I am going to start making my own soap and hugging trees" context. I suppose it's more of a reinforcement of what I have suspected. I just couldn't put my finger on it until reading this book. There are several lessons in the book and the author condenses them to nine lessons toward the end of the book. I suppose each individual will take away different lessons that will apply to them in their current time and place. I can imagine what it would be like to get up with the sun, walk to work, and work with my hands, followed by a mid-day meal of local grown fruits and vegetables with several family members and friends surrounding me. Let's begin with content unmentioned by previous reviewers. In the United States, only about one male per 20,000 reaches age 100 (p. 44). The almost-daily consumption of nuts is important to good health and long life (e. g., p. 130). On the other hand, supplementation with DHEA, human growth hormone, or melatonin is questionable and probably harmful (p. 13). Friendly intestinal bacteria are important, and these are thwarted by processed foods, excessive consumption of meat, surgery, etc. (p. 92). 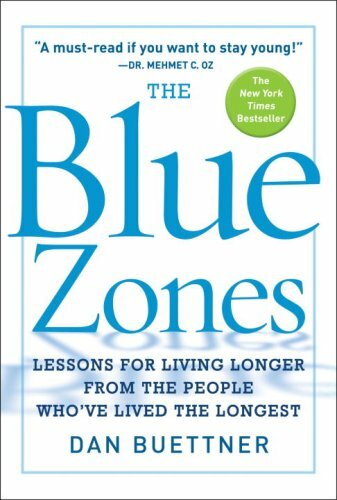 The geographical format of this book takes the reader to "Blue Zones" (areas with high concentrations of long-lived people) all over the world. One of them is right in the USA--the Seventh Day Adventist community 60 miles east of Los Angeles. Now consider the Okinawans. Though not Japanese themselves, they had been conquered by the Japanese, and forced to fight against the Americans. Many Okinawans, frightened by tales of American atrocities, committed suicide upon the approach of the American forces. Instead, the Americans helped the Okinawans. Ironically, however, the Okinawans were subsequently hurt by the Americans--but in a totally unexpected and unintentional way. Americans built a lot of fast-food joints, and the health of the Okinawans--especially the younger ones--began to decline. This book not only provides suggestions for extending one's lifespan, but also gives the reader an invaluable set of geography lessons. In the end, centenarians really cannot tell us why they lived to an age of 100 or more (p. xxi). But this book is fascinating nonetheless. There is a bibliography at the end of the book for further reading on the topics of longevity, better health, stress-free living, etc. The citations come from magazine articles, books, and scientific and medical journals. I found this book to be very interesting, and often felt I was right there with Dan on his journey of meeting all these centenarians from various parts of the world. What the book pointed out is that it's not so much the genes that provide for longevity as it is the lifestyle. This was proven to be true since most of the younger generation no longer lives the way the traditional ones do, and they are losing the longevity edge found in diet and lifestyle. Clues to longevity include exercise, but not the tedious kind--rather, the kind that you would integrate into your routine, such as walking or taking the stairs--or some sport or activity you enjoy. Another is diet: fruits and herbs rich in antioxidants, eating light, no processed foods, and little to no meat. Having a purpose, an active role and a family were also vital. A positive attitude was also a common factor, as well as a relatively stress-free life (or at least handling the stress well, and remaining care-free). The last chapter sums up all the tips found among the various blue zones, the common denominators that allowed each to live long and will allow you to live long if you integrate these habits into your life. I imagined myself going to live a simple life out in a peaceful, pristine village. One thing I kept wondering, though: Would living life less intensely be worth the trade-off for living longer? When we live very busy lives, are we simply packing more life into a shorter time? I read Dan Buettner's book with great interest. He has spent much time studying "pockets of longevity" and his stories are informative and entertaining. We can learn much from the book, the value of caloric reduction, eating mostly plant based foods, working all your life etc.